We acknowledge the Indigenous owners of the land on which our conference takes place, the Wurundjeri and Kulin Nation, and pay our respects to their Elders and families, past and present. Founded in 2003 by a team of linguists and musicologists at the University of Sydney, Australian National University and the University of Melbourne, the Pacific and Regional Archive for Digital Sources in Endangered Cultures is now celebrating its ten-year anniversary. In the first decade of operation, PARADISEC created an archive of more than 3000 hours of audio recordings of language and music recordings from the Pacific, Asia and beyond. The digital collection now contains over 6 TB of data with a queue of audio, video and image files still to be ingested into the archive, and PARADISEC was recently included in the UNESCO Memory of the World Register. In this presentation, we will trace the development of PARADISEC from its origins as a storage facility for precious research data. We will discuss the ways that uses of the archive have grown and changed over the years, and reflect on prospects for PARADISEC's future in a fragile funding environment. Witnessing the explosion in the amount of digital data over the past decade many authors have concluded that not everything can be preserved, that we must instead develop strategies for prioritizing objects for digital preservation (Ooghe and Moreels 2009). Digital language archives have been at least partly immune to these arguments, owing both to the nature of the data they preserve and to their status as early adopters. From the outset language archives have worked closely with the documentary linguistics community to develop standards for data portability which greatly simplify preservation and access (Bird and Simons 2003). The products of modern language documentation are by design much easier to archive than, say, eBooks or video games. Moreover, digital language archives have generally had privileged access to large computing infrastructures, often through particular arrangements with cyber-infrastructure built for hard science data storage and analyses. As digital archiving comes of age and digital language archives are brought within the fold of larger digital preservation efforts, the pressure to prioritize preservation goals will increase. Before we decide to discard materials as superfluous, it is useful to consider some of the ways language archives are being used. In this paper I review some current uses of materials housed at the Alaska Native Language Archive (ANLA). Though designed exclusively as a repository of linguistic knowledge, ANLA is now increasingly recognized by its user community as a rich source of ethnographic information. Language documentation is for the most part a holistic effort, and though language documenters may not be specialists in topics such as botany, kinship, or geography, they are often the only ones to record this knowledge. Hence the value of language archives as repositories of traditional knowledge. Of course, ANLA is also a rich source of more traditional linguistic documentation. This is not surprising in cases where little or no published documentation exists. However, increasingly we are discovering important information which was excluded from published reference works, ostensibly because it was not thought to be important at the time. Archival documents have revealed errors and oversights in the published records for even the most well-documented Alaskan languages. While anecdotal, these experiences demonstrate the value of preserving all linguistic data, even in cases where good published documentation exists. Digital language archives must resist pressure from the wider library and archives community to prioritize preservation efforts and triage collection. Fortunately, digital language archives are already ahead of the curve, having developed inter-institutional frameworks which stress regional focus and avoid duplication of preservation efforts (Barwick 2004, AIMS Working Group 2012). 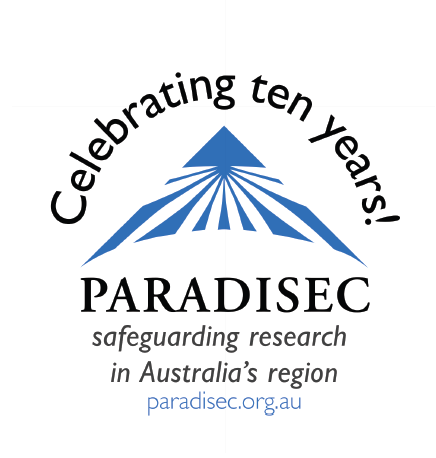 On this tenth anniversary of PARADISEC it is encouraging to note the great progress which has been made in the development of digital ethnographic archives; however, we must also be prepared for a new era in which digital archiving is a quotidian effort and we face increasing pressure to discard materials. AIMS Working Group. 2012. AIMS Born-Digital Collections: An Inter-Institutional Model for Stewardship. Barwick, Linda. 2004. Turning It All Upside Down . . . Imagining a distributed digital audiovisual archive. Literary and Linguistic Computing 19.253-63. Bird, Steven and Gary Simons. 2003. Seven dimensions of portability for language documentation and description. Language 79(3).557-82. The language documentation and conservation (LD&C) track in the Master of Arts program in the Department of Linguistics at the University of Hawai'i at Manoa (UHM) is unique in the United States and one of only a small handful of graduate programs in the world offering advanced degrees in the documentation of endangered languages. A key component of the program is the integration of the Kaipuleohone University of Hawai'i Digital Ethnographic Archive into the curriculum.1 This paper discusses the development of Kaipuleohone and its increasing role in the professional development of students in the LD&C program at UHM. Kaipuleohone was started in 2008 by Nick Thieberger (Albarillo & Thieberger 2009). The original mission of the archive was to provide a permanent secure home for digitized language recordings from scholars affiliated with UHM over the five decades since the Department of Linguistics was created. During the first phase of Kaipuleohone, hundreds of recordings from eminent field linguists like Derek Bickerton and Robert Blust, as well as the collection of the Charlene Sato Center for Pidgin, Creole and Dialect Studies, were digitized and ingested. Now in its second phase, Kaipuleohone has increasingly become an archive for materials actively being collected, especially by students in the LD&C program. The core curriculum stresses the importance of archiving in the language documentation workflow, and Kaipuleohone provides an opportunity for students to develop good habits of consistent metadata collection and regular deposit, even from the field. Students are required to consider issues surrounding data longevity, access, and multipurpose value early in their careers, better preparing them for achieving the best practices of contemporary language documentation as professionals. In addition, good archiving practices among our students allows us to require the proper citation of documentary source materials in doctoral theses via permanent handles, furthering the scientific goal that linguistic claims be verifiable by data, and thus increasing the quality of scholarship in the Department. Kaipuleohone conforms to international archiving standards for digital archives. Audio files are stored at high resolution and the metadata conforms to the Open Language Archives Community, Open Archives Initiative and Dublin Core. All digital files are curated by the Library system at the University of Hawa'i's D-Space repository, ScholarSpace. Albarillo, Emily A. & Nick Thieberger. 2009. Kaipuleohone, the University of Hawai'i's Digital Ethnographic Archive. Language Documentation & Conservation 3(1): 1-14. On the basis of these observations, which we will illustrate by means of three detailed “case studies” from the Eastern Himalaya, the Burmese/Indian border region, and the Balkan region, we will argue that ISO 639 must be substantially re-conceived and re-organized before it can be supported by linguists. The Community and the archive -- preservation, ownership and dissemination. Archives had been thought of remote ivory tower spaces with dim vaults and dusty shelves. However archives have been changing as what is archives has changed from state documents to include audio visual documents and cultural expressions. With this change , there is also the shift of who such an archive is for and who uses it and for what. The relationship of archives to the communities that it interacts with is one that has been undergoing change in the past decade, as the concept of the community comes to the centre of the discourse in many areas. The UNESCO Convention for the Safeguarding of Intangible Cultural Heritage places the community and its rights at the centre in many of its directives, WIPO works on community rights for archives, libraries and museums, and so forth. These are not initiatives of large international bodies. The concept of heritage has gone from that of 'high art' to cultural expressions, Masterpieces have been replaced by Representative Lists, the voice of the subaltern, the concept of “bottom up” approaches are at the centre of discussion in many areas, and community archives is not a term that is uncommon any more. I plan to discuss some of these issues as they relate to archives, and trace the path taken by an ethnomusicology archive through its development and its changing aims and profile. Linguistic scholarship in the data‐driven 21st century Two important forces have been acting on the discipline of linguistics since late in the twentieth century: technological changes which allow the capture and dissemination of high quality multimedia data efficiently and at a reasonable cost, and an emphasis on the collection of primary data as a response to deep concerns about the reduction of linguistic diversity across the world. The convergence and interaction of these two forces is driving changes to scholarly practice in the discipline. With an organisation such as PARADISEC celebrating its tenth anniversary, we can identify some aspects of those changes which are stabilising and it is therefore possible to speculate in an informed fashion about what linguistic scholarship will look like in the coming decades and to consider the implications. In this paper, we will argue that there are implications for technical infrastructure which are being addressed at least to some extent, but that the implications for the social infrastructure of our discipline, particularly channels of dissemination for scholarly work, are much more profound and are not yet being adequately addressed. We suggest that 21st century linguistics will be increasingly based on access to primary data. By this we mean access at all stages of the process of scholarship: access to shared data in well‐organised repositories as well as the possibility of directly citing data in our publications. The infrastructure for archiving exists (witness PARADISEC); additional elements such as servers which allow clients to address specified segments of media files on demand are being discussed and developed (RNLD List April 2013). On the other hand, the less tangible infrastructure to support these changes is not yet so prominent. Direct citation of primary data means moving fully to electronic publishing; by this we mean not merely making work available online in a format such as pdf, but reconceptualising our forms of scholarly communication as essentially freed from text on paper. This in turn implies a reworking of the systems of gate‐keeping and prestige which are associated with the current publication models, and such changes must also include the recognition of the deposit of properly curated data as an accepted part of scholarship. Moves in these directions have begun: last year saw the appearance of a volume devoted to the topic of electronic grammaticography (Nordhoff 2012), and the Australia Linguistic Society is engaged in a dialogue with the Australia Research Council about the recognition of data deposits as research outputs (Thieberger, Margetts, Morey, Musgrave and Schembri 2012). We suggest that the benefits of a linguistics which is closely linked to primary data are evident and moves in this direction are therefore inevitable. But the concomitant changes to the institutional structures of scholarship will be profound and complex. Nordhoff, Sebastian (ed.). 2012. Electronic Grammaticography. Hawai'i: University of Hawai'i Press. More and more programs use XML formats for internal data storage, not only for interchange. This includes both general-purpose tools like MS Office and OpenOffice/LibreOffice and specialized linguistic software such as ELAN, EXMARaLDA, FLEx, Speech Analyzer, Arbil, WeSay, SayMore and so on. Thus more and more linguistic data are being created in XML, not just convertible to XML. Although not ideal (verbosity, high processing time), XML formats have a number of benefits to boost workflow efficiency. Importantly, XML documents can be processed with XSL transforms to get new data, remaining still in the realm of XML (the XSL transforms themselves are also XML and can be transformed by other XSL...), displayed as HTML or published into PDF. Finally, there are now mature free native-XML databases like eXist-db and BaseX which offer the full cycle of operations in one application with browser-based interface: store existing documents, browse and query data, create and edit data online, apply XSLT to publish. I will illustrate this with examples of transformations we used in language documentation workflow to convert interlinear texts in Archi (East Caucasian) between various formats including OpenOffice and FLEx. A connected issue which will be addressed is the need for an interchange standard format for interlinear texts. This talk will introduce Arbil which is a tool for managing metadata that describes research data, such as audio or video files, allowing research data files to be easily searched both before and after they are archived. Arbil has been developed at The Language Archive at MPI­PL (Author, 2012) and was originally designed for the DOBES community to replace the IMDI Editor. The core needs expressed by this group was viewing and editing the metadata when in the field and being able to edit more than one metadata file at once. Indeed, Arbil is fully functional offline, provides tabular editing, and for robustness stores only text metadata files. For moving metadata and associated resources into an LAT archive, the structure is exported from Arbil and then uploaded into LAMUS (Broeder et al., 2006). Arbil was originally designed to support IMDI metadata (Broeder and Wittenburg, 2006). This format has been in use for many years, and it covers most needs with a number of set fields, but also may confuse researchers and slow down the workflow with so many fields to fill in. This issue has been addressed by CLARIN (Va ́radi et al., 2008). CLARIN provides flexible metadata fields, allowing a custom profile to be designed for each project ­ only the relevant metadata fields need to be offered to the end user, greatly simplifying the process of creating metadata. Arbil has now been updated to support both IMDI and Clarin metadata formats. Because of the flexible design of Arbil, some of its components such as the metadata table and tree have been utilised in KinOath Kinship Archiver (Author, 2011). This application builds on the core functions of Arbil, onto which it adds an XML database to provide fast searches. Also, a plugin layer has been introduced in KinOath which has been migrated back into Arbil. Another project that is in the prototype stage is a web based search similar to the search in Arbil. These changes are being combined together as a search plugin for Arbil which is in development that will allow much more powerful searches to be available without compromising the original design of the application. Author. 2012. Metadata Management with Arbil. In Proceedings of the Eighth International Conference On Language Resources And Evaluation (LREC 2012) Satellite Workshops, pages 72--75. Istanbul. http://www.lrec­conf.org/proceedings/lrec2012/workshops/11.LREC2012%20Metadata%20Proceedin gs.pdf Author. 2011. KinOath, Kinship Software Beta Stage of Development. Talk presented at Atelier d'initiation au traitement informatique de la parenté. salle 3, RdC, bât. Le France. 2011­12­16. D. Broeder and P. Wittenburg. 2006. The IMDI metadata framework, its current application and future direction. International Journal of Metadata, Semantics and Ontologies, 1(2), pages 119--132. T. Váradi, S. Krauwer, P. Wittenburg, M. Wynne, and K. Koskenniemi. 2008. Clarin: Common language resources and technology infrastructure. In Proceedings of the Sixth International Conference on Language Resources and Evaluation (LREC'08), pages 1244--1248, Marrakech. European Language Resources Association (ELRA). http://www.lrec­conf.org/proceedings/lrec2008/pdf/317_paper.pdf. Matzner, Andrew. 2001. 'O au no keia: voices from Hawaii's Mahu and transgender communities. Bloomington, Indiana: Xlibris. Aikuma is an Android app for collecting and sharing recordings and phrase-aligned commentaries, including respeakings and translations. Recordings are automatically synchronised between phones. A new web-based transcriber app permits a user to keyboard a transcription and a translation while listening to the source audio along with any available commentaries. These transcriptions are saved back to the phone and automatically synchronised to the other phones, for time-aligned playback. We will demonstrate the software and report on recent field experience. The Ma! Project's (themaproject.org/‎) first app + database package is a crowdsourcing lexicon development system consisting of a smartphone/tablet app which allows users to sync audio, video, text and image data to an online database for the purposes of building dictionaries. Synced data is curated via an online moderator control panel. Approved user contributions are used as the basis for new entries, or for modification of existing entries, which are then published to the app. The next time any user syncs, the new or modified entries will be added to the dictionary on their device. The project aims to engage younger speakers of endangered languages in the documentation process. The app has been made available for Android and iOS. So far we have piloted in three endangered language contexts: Iwaidja (Northern Australia); Mokpe (Cameroon); and Bena Bena (PNG). We are currently developing versions for Gamilaraay (NSW), Somali, and the 17 languages used by the Darwin-based Aboriginal Interpreter Service, all of which are expected to be operational by the end of 2013. The presentation will consist of a live demonstration of the app and moderator control panel. For those wishing to preview the app, search for 'Ma Iwaidja' on Google Play or the App Store. Wednesday 2.45-5.00 Panel discussion: What do we still need -- standards, tools, methods? Despite tools such as Elan, Toolbox and FLEx being available for some time there is still a low level of use of these tools by fieldworkers, and, where the tools are actively being used, there is a sense of frustration first at how difficult they are to learn and then at how difficult it is to transfer data from one tool to another. Is part of the problem of uptake related to these difficulties? What needs to be done to increase the use of existing tools and to build better ones? What would a fieldworker's ideal software suite contain? Linguistics in the Pub Optional activity at a local pub - Queensberry Hotel, 593 Swanston St (Corner Swanston and Queensberry streets) see the RNLD LIP webpage. All cultural groups have their own calendars of festivities and public celebrations. These can be religious or traditional ceremonies, major life milestones or a condoned opportunity for group-wide entertainment. In this session we'll talk about the documentation of cultural events from a variety of perspectives. We will discuss the importance of capturing cultural events in order to provide well-rounded documentation, as such events are often rich in ethnographic detail, specialised lexicon and unique genres of language use. We will discuss the technical challenges of capturing large, out door events in often sub-optimal conditions. We will also consider what constitutes a successful documentation of such an event, as well as the need to discuss such documentation closely with the communities that allow us to be a part of these events.